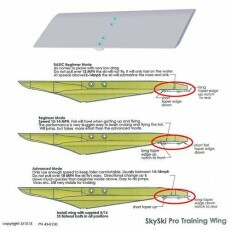 The all new Sky Ski Training Wing is here! With three different ways to put this rear wing on, and each way will have a different result for your beginner. Try the "Basic Beginner" setting for the first timers, or "Beginner" or "Advanced" for those who have already gotten up a time or two and just need that added stability to progress through learning to fly the foil quickly & easily. Bolt pattern fits the Pro SS & Launch model skis. Will also fit the LE with a wing adapter.